It's official: The Federal Reserve thinks the U.S. economy is ready to walk under its own power. In a move that ends an unprecedented period of easy monetary policy, the central bank on Wednesday delivered its first interest rate hike since 2006, with the decision a unanimous one. The Fed raised its key federal funds rate to 0.25 percent, up from at or near zero percent for the last seven years. "The first thing that Americans should realize is that the Fed's decision today reflects our confidence in the U.S. economy," Fed Chair Janet Yellen said in a news conference. "While things may be uneven across all regions of the country, we see an economy on a path of sustainable improvement." Policy makers separately projected a rate of 1.4 percent by the end of 2016, implying four quarter-point rate hikes would be coming in the new year, unchanged from its prior stance. "The patient no longer needs intensive care in terms of the U.S. economy," said Jim Russell, a principal and portfolio manager at investment advisory Bahl & Gaynor. "It's a big deal because it does signal the start of a rate cycle. How far they go with it and how frequently they increase rates is the open question." Shortly after the Fed's rate decision, major banks including Bank of America, Wells Fargo, JPMorgan Chase and U.S. Bancorp announced hikes in their prime lending rates, from 3.25 percent to 3.50 percent. The new policy represents a calculated risk that the American economy, which continues to rebound from the devastating housing crash that shook the global financial system, is healthy enough to start withdrawing the extraordinary financial support provided by the Fed in the years following the meltdown. "This is really just the beginning of the return to normalcy," said Peter Conti-Brown, a legal studies expert and financial historian at the Wharton School at the University of Pennsylvania. "There are years ahead of us where the Fed has to make decisions to put interest rates back at their historical norms." 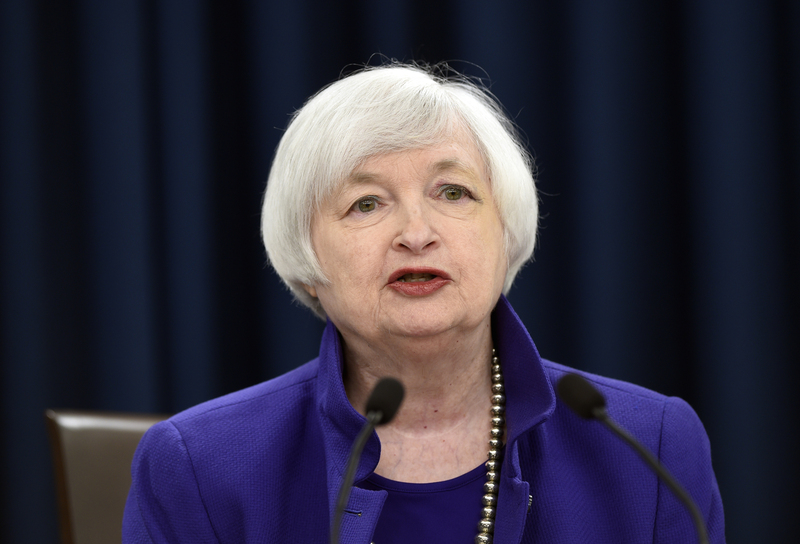 Although Yellen has signaled that the time is ripe to begin normalizing monetary policy, the decision remains contentious. Many investors and Wall Street forecasters have urged central bankers to tighten policy, warning that extending the period of near-zero interest rates could unleash inflation. Other economists, pointing to weak inflation and arguing that the nation's low unemployment rate understates the amount of slack in the economy, fear that hiking rates could halt the recovery in its tracks. Fed officials clearly feel the economy, while bearing heavy scars from the 2008 financial crisis, is sufficiently healed to act now. The much-anticipated "liftoff" in rates comes amid economic data showing steady hiring, consumer spending and other signs of strength. "A range of recent labor market indicators, including ongoing job gains and declining unemployment, shows further improvement and confirms that underutilization of labor resources has diminished appreciably since early this year," the Fed said in its policy statement, saying in its policy statement that economy is growing a "moderate" pace. Fed median forecasts project the economy to grow 2.1 percent this year and for unemployment to remain at 5 percent, consistent with the last forecast in September, the central bank said in its latest economic projections. It sees growth reaching 2.4 percent in 2016, with the jobless rate falling to 4.7 percent. The Fed expects growth of 2.2 percent and 2 percent in 2017 and 2018, respectively, and for longer run unemployment to remain below 5 percent. By contrast, inflation remains below the Fed's 2 percent target, a sign the economy continues to operate at less than full capacity. The personal consumption expenditures index -- the Fed's preferred measure of inflation -- stood at 0.2 percent in October, a far cry from the central bank's goal. Another gauge of inflation had the cost of living holding steady last month. The consumer price index, excluding food and energy, rose 0.2 percent in November for a third consecutive month, the government reported. "Conditions today are relatively weaker than when the Fed raised rates last in June 2006," Christopher Vecchio, currency analyst at DailyFX, said in an email. "This is a softer environment to hike rates in that in past cycles." In June of 2006, the last time the Fed raised interest rates, the U.S. unemployment rate was 4.6 percent and core CPI was 2.6 percent. That compares with a current jobless rate of 5 percent and inflation of 1.9 percent. Fed officials expect inflation to start edging higher once global commodity prices stabilize and the dollar halts its advance. "What the Fed does on Wednesday is important, but what the Fed says about 2016 is even more important," Vecchio said. The rate hike "reflects the committee's confidence that the economy will continue to strengthen," Yellen said Wednesday in explaining why the launch from zero has finally arrived. Yellen's "answers have been very dovish, which is apparently just what the market wanted to hear," said JJ Kinahan, chief strategist at TD Ameritrade. "I don't think anybody should had been surprised by this. The market is getting what it wanted -- it wanted a raise and it wanted her to have a dovish tone."